Large flowered Crocus, the name says it all! Providing fresh spring colour for pots and containers in the garden or on your balcony. Fantastic for naturalizing as they come back year after year. Perfect for planting under shrubs and trees. Supplied as a pack of 100 bulbs ready for planting. Large-flowered Crocus, the name says it all! 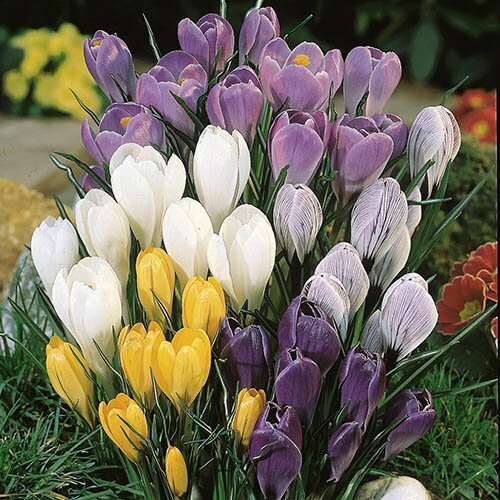 Providing fresh spring colour this wonderful mix coloured crocus are great for pots and containers in the garden or on your balcony. Good for naturalizing as they come back every year and are perfect for planting under shrubs and trees. Supplied as a pack of 100 bulbs in mixed colours, ready for planting. Size: 7/8.